Turkey Club UK are working with Rare Breed Survival Trust to promote traditional heritage turkeys supported by Poultry Club GB. A plea to get traditional turkeys that are on the RBST Watch list strutting their stuff at shows on RBST stands. 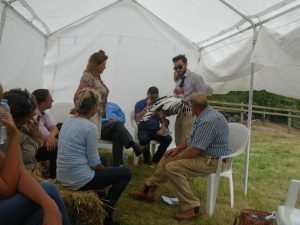 In August a training even was run on behalf of RBST. The trainers were Peter Hayford, Malcolm Thompson, Ian Waterman, Philippe Wilson and Brenda Waterman. There were 12 invited attendees plus Richard Broad and Tom Blunt from RBST. David Pearson arrived in the afternoon to give an illuminating talk on the health of standard turkeys. It was a great day, the sun came out and lots of interesting conversations were had.. The feed back has been good and we have signed up some new members from the group. RBST working with TCUK are going to launch a project to promote the 10 standard varieties of turkey on their ‘Watch List’, to help promote this they would like good examples of these breeds to be at local shows on the RBST stands to make people aware of the different varieties.